THE STORY - Looking to escape from his dying world, the orc shaman Gul'dan utilizes dark magic to open a portal to the human realm of Azeroth. Supported by the fierce fighter Blackhand, Gul'dan organizes the orc clans into a conquering army called the Horde. Uniting to protect Azeroth from these hulking invaders are King Llane, the mighty warrior Anduin Lothar (Travis Fimmel) and the powerful wizard Medivh. As the two races collide, leaders from each side start to question if war is the only answer. THE BAD - The story can be quite confusing for those whoa re not familiar with the material. Acting is hit or miss and moments of forced humor only hurt the film. So let's get this out of the way quickly. I have never played Blizzard's "Warcraft" video games. So heading into this, all I knew was that it was going to be a special effects driven fantasy by Duncan Jones, who directed two of my favorite films in their respective years, "Moon" and "Source Code." What "Warcraft" turned out to be, once the ending credits appeared on the screen, was a misguided disaster of filmmaking on nearly every level. I say nearly, because "Warcraft" does have some decent qualities and in a possible extended director's cut, there may be a good movie in there somewhere. But as it stands, this fantasy story is a mess of epic proportions. In order to escape their dying world, the orc leader Gul'dan (Daniel Wu) utilizes dark magic to open a portal to the human world known as Azeroth. One of the leaders of the Frostwolf Orc Clan, Durotan (Toby Kebbell) realizes that the dark magic wielding Gul'dan is dangerous to their people and wants nothing more than to protect his family and his race. An unlikely alliance with the humans may be the only solution as he will seek the help of King Llane (Dominic Cooper), the great warrior Anduin Lothar (Travis Fimmel) and the powerful wizard Medivh (Ben Foster). Garona Halforcen (Paula Patton) is a half human/half-orc caught between the tensions of the Human Alliance and the Orc Horde as their worlds start to collide. 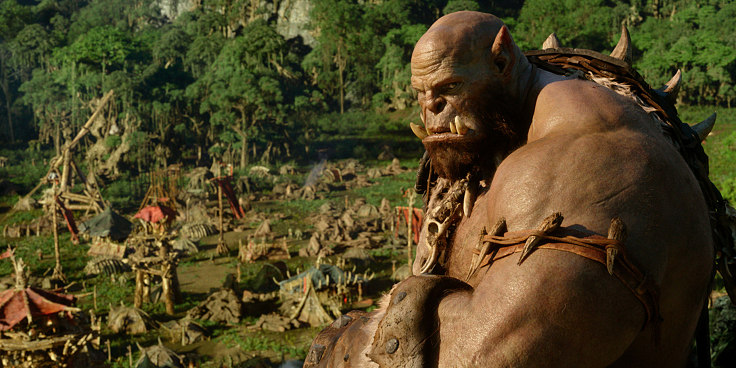 A lot of care was put into the world of "Warcraft" (No pun intended). The costumes, makeup, art direction, and visuals are breathtaking to behold and even trump other modern day fantasy films such as "The Hobbit Trilogy" (Nothing can top "The Lord of the Rings Trilogy" still). Even the music by Ramin Djawadi ("Game Of Thrones") and the visual effects all enhance the quality of the film instead of hinder it. Had Duncan Jones been able to craft a comprehensible screenplay, get more convincing performances out of his actors and had a completely re-edited film (Some of the transitions and jump cuts are atrociously bad), "Warcraft" would at least be considered passable. But when a film crashes and burns as hard as this one does, it needs to be noted. The film is barely understandable throughout the entire running time due to the rich lore of the world and the creatures within it. Different tribes of orcs, different magic types, and of course hard to pronounce names make this film an exercise in how well you can pay attention and process information, than being entranced. When the film does attempt to input comedy or drama into the film, it's forced and never convincing. There were more than a few moments within the film where I could hear audience members groaning at the laughable dialogue and the terrible delivery with which the actors spoke it. Travis Fimmel is woefully miscast as the hero of this story when his piercing eyes and brooding features make him look more like a villain than anything (And the less said about his attempts at "acting" in this film, the better). And Dominic Cooper, who has recently found success on AMC’s “Preacher,” has as much charisma and commanding authority as the prop crown he wears than the human king of Azeroth. The orcs (Mainly Paula Patton as the half human/half-orc Garona and Toby Kebbell as the chieftain orc Durotan) are standouts. But the real star here is Ben Foster, who once again delivers a convincing performance regardless of the quality of the film and the other dreadful performances surrounding him. I'm not saying "Warcraft" is all terrible. The action scenes (Particularly towards the end) are a sight to behold and there are some truly gorgeous visuals. It is clear that Duncan Jones had the passion for the project but lacked the capability to pull off a film of this magnitude, especially after working on more low budget character driven science fiction films beforehand. I anxiously await a director's cut (The sloppy editing in this film proves that there must be one) which will hopefully bring more clarity to Jones's vision. Maybe more voiceover narration to help with understanding the narrative? I suppose it doesn't matter. Nothing is going to fix the film's wooden acting and heavy exposition. I've been told that for fans of the game, "Warcraft" is a triumph. But for those of us who are still waiting for a decent adaptation of a video game, the wait continues.